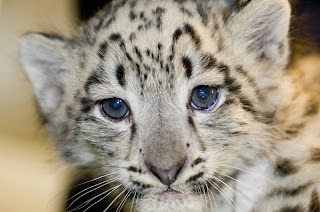 “Hey, sweetie” may sound pretty cute, but a male snow leopard cub needs a befitting name to match his majestic beauty. Starting next week on August 4, you can help name the 2½-month-old cub through Woodland Park Zoo’s online naming poll. Mongolia is one of the 12 countries that is home to the endangered snow leopard. The winning name will be announced when the cubs make their public debut at Snow Leopard Day on Saturday, August 15. 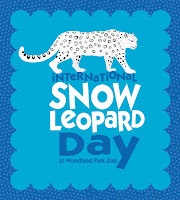 The third annual event is hosted by the zoo and its conservation partner, the Snow Leopard Trust, to highlight the fascinating adaptations of the snow leopard and critical conservation efforts to protect them in the wild. 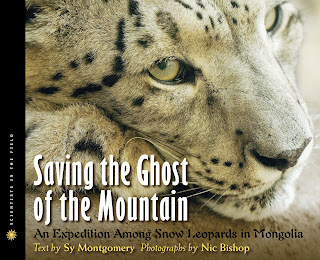 Once you vote, snow leopard fans ages 18 and older will also have a chance to enter to win a fabulous snow leopard prize package: a 12-month ZooParent adoption of a snow leopard with a plush snow leopard and certificate; a signed copy of “Saving the Ghost of the Mountain: An Expedition Among Snow Leopards in Mongolia” by award-winning author Sy Montgomery and photographer Nic Bishop; and a commemorative framed photo of the snow leopard cubs. Stay tuned next week for the naming poll link when the poll kicks off on Tuesday! Savvy parents know all about coming to the zoo when it rains in Seattle. They visit Zoomazium, Woodland Park Zoo’s award-winning, LEED-certified indoor play area for kids to learn about nature – and have a great time doing it. But Zoomazium is another great choice now that the weather is in the 90’s. It’s air-conditioned! In this all-season space, children 8 and under connect with the wonders of the natural world. 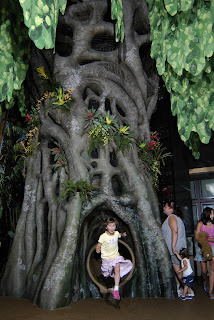 Kids discover a new favorite animal, star in a nature play, or climb, slide and explore their way through a magical world. What’s more, after pretending to be a big cat or an ape, they can walk outside and in just a few short steps, meet a real live jaguar or a gorilla in a beautiful, naturalistic habitat. The building is designed to LEED-gold standards, the first in a North American zoo. And for those trying to beat the heat in the Seattle area this summer, it is still a great idea to come to the zoo. Zoomazium is open daily and is free with zoo admission or membership, and there is programming every afternoon. But remember – no adults without kid supervision. Meet WNBA Seattle Storm stars Ashley Robinson and Janell Burse on Sun., August 2 from 4:30 – 5:30 p.m. at Woodland Park Zoo! You can catch Robinson and Burse as they tour the Humboldt penguin and Willawong Station exhibits, then meet them for an autograph under the Storm tent at the southwest corner of the North Meadow, across from penguins. For being a zoo AND Storm fan, you get half off tickets for Zoo Night at the Seattle Storm vs. Phoenix Mercury game on Tuesday, August 4 at 7:00 p.m. Follow this link to purchase regularly-priced $34 seats for just $17! Be sure to visit the Penguin Wagon and zoo table on the West Plaza before the game and say hi to us. For the first time in three years, Woodland Park Zoo is once again home to the Matschie’s tree kangaroo! This endangered species is endemic to Papua New Guinea and is known for its bear-like head, bushy tail and marsupial’s pouch. Huen, an eight-year-old male, is a little shy when it comes to the camera, but we snapped this photo of him while he was perched up in a tree. Huen arrived from Singapore Zoo in March and can now be found living in the Day Exhibit. 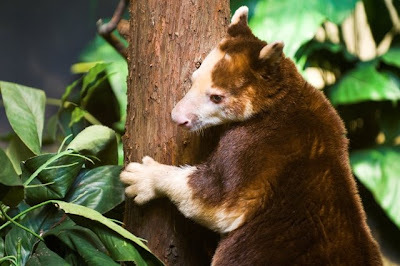 As one of the newest conservation ambassadors at the zoo, Huen represents the inspiring work of the Tree Kangaroo Conservation Program, founded and based here at Woodland Park Zoo. You might remember the big news we shared earlier this year when Woodland Park Zoo’s Tree Kangaroo Conservation Program celebrated a milestone with the passage of Papua New Guinea’s first ever national Conservation Area, preserving 187,800 acres of forest habitat for the endangered Matschie’s tree kangaroo and thousands of other endemic and endangered species. We look forward to introducing a mate to Huen next year, and hopefully breeding the endangered pair as an important part of our conservation work with the Association of Zoos & Aquariums’ Species Survival Plan. (Top) Huen at Woodland Park Zoo, photo by Ryan Hawk. 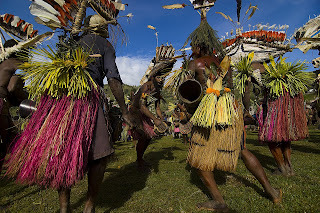 (Bottom) Papua New Guinea villagers celebrate the passage of the first national Conservation Area, photo by Ryan Hawk. 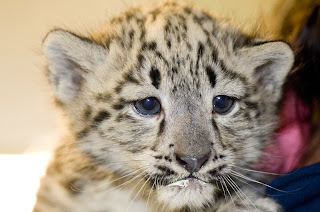 The pair of snow leopard cubs are growing, playing and now testing the likes of solid food! See the male and female siblings get their six-week examination and receive their first set of vaccinations as part of the zoo’s excellent animal and medical care program. Then at the end, watch them be rewarded with their first taste of solid food—chicken! The cubs were born on Memorial Day to first-time parents, 4-year-old Helen and 3-year-old Tom. Mom and cubs remain off public exhibit to ensure continual bonding and proper nursing while staff monitors the new family via an internal web cam. The male weighed in yesterday at 7 pounds and the female, 6 pounds. According to their keepers the cubs are venturing outside the birthing den more frequently and playing, particularly favoring a game of playing with mom’s tail! Dr. Kelly Helmick, associate veterinarian at the zoo, gave the cubs a clean bill of health and will continue to administer exams and the necessary vaccinations until they reach about 16 weeks. Stay tuned for more updates on the pair. Photos: Top--female cub; bottom--male cub. Photos and video by Ryan Hawk. 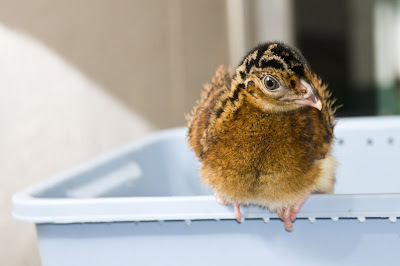 A Northern helmeted curassow chick hatched 6/26 with a little assistance from keepers since the chick wasn’t making much progress after 48 hours of effort. It is now located behind the scenes in a brooder box next to its mother in the zoo’s Conservation Aviary in the Temperate Forest zone. By keeping it next to her, the chick should become more properly socialized and have less of a chance of imprinting on humans. To reduce imprinting, staff minimizes talking in the presence of the chick. 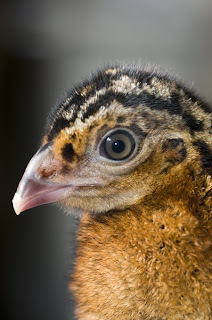 Like chickens or turkeys, curassow chicks are precocial at hatching—meaning they are born relatively independent—and with guidance, they learn to eat on their own very quickly. To stimulate it to eat, we use objects like tweezers or a long stick with a red tip to point food out to the chick. These chicks are also very arboreal and they like to perch up off the ground. At hatching, their wing feathers are very well developed which allows them to take short flights at a very young age. These chicks also grow relatively slowly (compared to other species like frogmouths or songbirds), and the chick now has a weight gain of ~5-8% per day. Its hatch weight was 133g (4.7 oz)…..10 times heavier than the frogmouth chick was at hatching!! Curassows belong to one of the most endangered groups of birds in Central and South America. Many species are endangered due to habitat destruction and illegal hunting. Want to join a Woodland Park Zoo team restoring habitat for wildlife at Licton Springs Park? Sign up for a habitat restoration event with us and EarthCorps! Back on May 16, our zoo team had a great time with EarthCorps and community volunteers restoring habitat at Golden Gardens Park. And now, we’re doing it again! This summer WPZ invites you to share the habitat by taking action to protect and restore wildlife habitat around the world and in our own backyards. 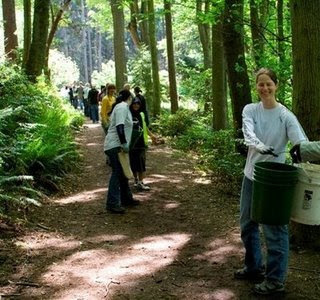 On Saturday, July 11th, a team of zoo staff, volunteers, and friends will be joining Earth Corps and the Green Seattle Partnership for a restoration event at Licton Springs Park in north Seattle. Saturday, July 11th, 10:00 a.m. – 2:00 p.m.
You'll be side by side with zoo staff and volunteers planting native trees, shrubs, and ground cover. EarthCorps will provide gloves, tools, water, light refreshments (coffee, tea, water and donuts!) and a talk that covers safety, environmental restoration and the overview of the project. We suggest that restoration volunteers dress in layers of older clothes that include long pants, long sleeve shirt and a jacket. Durable footwear such as work boots, hiking boots or running shoes are recommended for these events. These events take place rain or shine so please come prepared for the weather. Bring a lunch as well as water and a coffee cup/travel mug for refreshments. Please do not wear open toe shoes or sandals. · Click on "Sign up for this event"
· If you're a new Earth Corps volunteer, click the "Sign up" button next to "I'm a new volunteer." If you're a returning EarthCorps volunteer, enter your email and password. Did you see today’s Seattle Times cover story about the Cedar Creek Corrections Center inmates helping to raise and reintroduce endangered Oregon spotted frogs to Washington habitats? It’s all part of a great recovery program Woodland Park Zoo has joined with the Washington Department of Fish and Wildlife and the Northwest Zoo and Aquarium Alliance. Here in our own Northwest backyard, we’ve seen populations of the Oregon spotted frog diminish significantly, all but lost to wetland degradation and chytridiomycosis—a deadly, fast spreading fungus. Add to that the introduction of predators such as the bullfrog, and this native frog has disappeared from much of its original habitat. These factors prompted Washington state to list the species as endangered in 1997. It may also ultimately lead to a federal endangered listing soon. But hope is on the horizon. 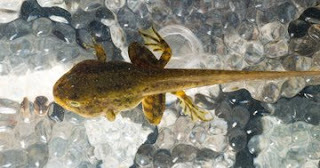 Woodland Park Zoo has joined a multi-institution recovery project that is pairing captive rearing of frogs with a wild release program to bring this species back from the brink. Scientists have selected Dailman Lake at Fort Lewis as a reintroduction area because it contains one of the largest relatively intact wetlands remaining in the Puget Lowlands. 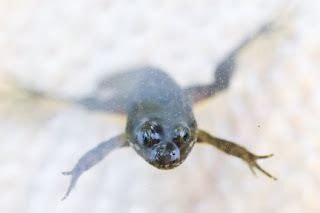 Reintroducing the Oregon spotted frogs to this habitat first requires Woodland Park Zoo and other institutions to headstart these frogs from embryo to full fledged frog, a process that takes 13 to 16 weeks. Headstarting starts with eggs taken from marshlands, brought to the zoo, hatched and raised until the frogs reach an age and size where they can be safely released and be able to protect themselves from predators. We are headstarting the frogs behind the scenes at the zoo now, and we expect to release them some time this fall, after which we will track the frogs for movement and population patterns. The ultimate goal is to establish a self-sustaining population at the Dailman Lake site. (Top center) Life cycle of Oregon spotted frog. Courtesy of Northwest Zoo and Aquarium Alliance. 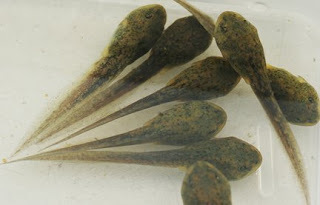 (Top left) Photo of Oregon spotted frog tadpoles by Mike Teller. (Bottom right and left) Photos of Oregon spotted frogs being reared at Woodland Park Zoo by Ryan Hawk. On June 23, Woodland Park Zoo became home to another significant addition…a bouncing eleven-month-old female giraffe named Tufani. She came to us from Dickerson Park Zoo in Springfield, Missouri. For those that remember, this is the same zoo that sent us Olivia, our other female giraffe. In fact, Tufani and Olivia are half sisters. And no, they don’t seem to recognize each other, but with giraffe, you never know. Like Olivia, Tufani is a Rothschild’s giraffe also known as Baringo or Lado giraffe. Although she is not a Reticulated giraffe like our males, the Association of Zoos & Aquariums’ Species Survival Plan manages them as one sub species so we have future breeding recommendations already. But don’t expect to see any infant giraffe running on the savanna anytime soon as our girls are still a bit young. If you’ve never seen a giraffe shipment before, it’s an interesting undertaking. I bet a few of you are wondering how we get them cross country. Do we fly them? Is it by semi-truck? How? And that’s a fair question. 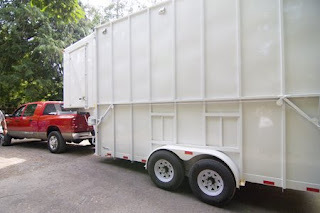 Think extra large horse trailer. The primary transporters we have been using have a specially built trailer that has a roof that can be extended upward if need be. This keeps the giraffe in an enclosed environment, away from the elements and, if the roof is cranked down some, allows the transporter to go under overpasses. The space is long enough for an adult giraffe to lay down if he/she would like or the giraffe can stay standing and just extend his/her neck. This is how both Olivia and Tufani arrived at our zoo. Tufani brings our current herd size to 2 males and 2 females. Even though giraffe appear gentle—and usually are—male giraffe will fight over female giraffe. So don’t expect to see all 4 on the savanna! So who does get to be with the females? Johari or Chioke? Chioke is the lucky boy. While doing our research in trying to find a suitable female for our herd, we contacted the studbook keeper and had her determine which of our males is more genetically valuable. And Chioke is the clear favorite in that regard. In fact Chioke is in the top half of most desirable males and Johari is ranked in the lower half of desirable breeding males. Tufani is a small girl (but cute!). She’s also somewhat darker than her older sister—in fact, she’s darker than all of our giraffe. You’ll know her right away once you get a chance to see her somewhere around the end of July. 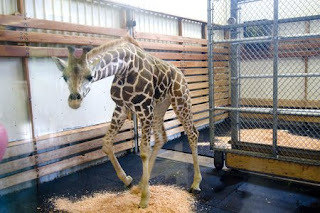 Until then, she’ll be staying in the giraffe barn on the African Savanna as part of the standard quarantine period for all incoming zoo animals.